You heard me right! We're off to visit Guam. While we all know the Chevy is magic, it's not water tight. Our Chevy does, however, have connections in high places. 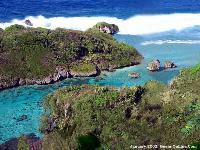 We're going to start our tour of Guam by going on an ocean cruise. Oh, but what about the Chevy? How about this. The good folks from the USA OCEAN DRIFTER have agreed to load our Chevy on their beautiful cruise liner so when we get to Guam, we'll have our transportation with us. 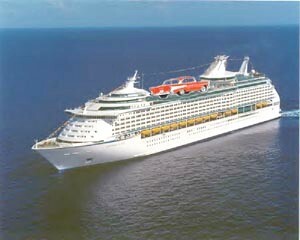 Every one sit back and enjoy the cruise. 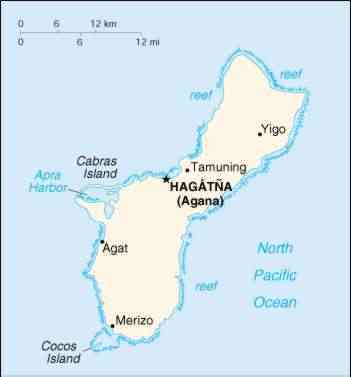 Guam is the southernmost and largest of the Marianas Archipelago. It is an unincorporated but organized territory of the United States. (Technically, I guess we could say Guam is the westernmost border of the U.S.). Everyone look to the right. I think I see Guam coming into view. Wow! We still have a while before docking. Thought you'd like to see the beautiful territorial flag of Guam. 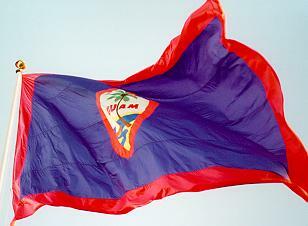 The territorial flag is dark blue with a narrow red border on all four sides; centered is a red-bordered, pointed, vertical ellipse containing a beach scene, outrigger canoe with sail, and a palm tree with the word GUAM superimposed in bold red letters; The U.S. flag is the national flag. 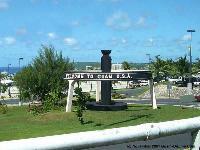 Good to see that Welcome to Guam sign. For the most part, our cruise was wonderful, but we sure hit some rough seas the last two days. Well, let's get the Chevy unloaded and see this tropical paradise.....UH OH!! We have a problem. Looks like our Chevy is a little seasick. I guess he hasn't gotten his "sea wheels" yet. Well, poor thing. Let's let him sit here in the parking lot and calm down. We'll go get something to eat and come back. I have an idea. While we're waiting for our Chevy to get himself straightened out, would you like to hear about some Ancient Guam Legends? They're fascinating. Just click on the license plate.